Why Visit Wapama Falls? If you've never taken a shower with your clothes on, cross the bridges below the falls in the springtime, and you'll never have to wonder about that particular experience again. If this doesn't appeal to you, take your clothes off first to keep them dry and add extra interest to the hike for everyone in your party. Even though Hetch Hetchy Reservoir has drowned the bottom 400 feet (130 meters) of these falls, the remaining 1,400 feet (420 meters) are still an impressive sight. 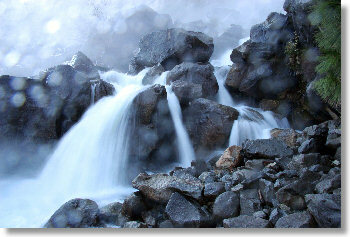 Best Time to Visit: in the spring, when there's lots of water pouring over the falls. Though if you're too early, there can be so much water that the trail is impassable. Crowd Factor: You'll find hikers scattered all along the trail, but it's still one of the least crowded waterfalls in Yosemite. Parking: There are two lots, one just before the trailhead and one just after. The one after the trailhead has a shorter walk to the trailhead, but the one before the trailhead (which has roughly a quarter-mile hike to the trailhead) has bathrooms. The road turns into a one-way loop as you approach the trail, so if you pass up the first lot and then decide you wanted to park there after all, you have about a 1.5 mile (2.4 km) drive to follow the loop back to the original lot. Hazards: Spray can be heavy on the bridges across the falls, and the water flow can occasionally reach dangerous levels. An October 2010 storm destroyed one of the bridges (see some photos of the damage), resulting in a six-month closure, and two backpackers were killed in June of 2011 while attempting to cross during unusually high water. If there's water flowing over the bridge or it doesn't look safe, please don't risk it. In addition, several streams that cross the trail en route to the falls can be difficult to cross early in the season, occasionally resulting in trail closures. There's also poison oak along the trail, and bears and rattlesnakes in the area (the backpacker campground farther along the trail near Rancheria Falls is notorious for bear activity).